Ras el hanout is a traditional blend of coriander, ginger, paprika and even rose petals, which gives Moroccan cooking its unique and characteristic taste. Mix the ras el hanout in a bowl with the oil, honey, finely grated zest of the whole orange and half of the juice. Add the lamb and rub all over to coat. Set aside and allow to marinade for 30 minutes. Place the couscous in a bowl and pour over 200ml boiling water. Cover with clingfilm and set aside. In a separate bowl, mix the chickpeas with the harissa. Warm a griddle pan over a high heat. Add the lamb and reduce the temperature to medium. Cook for 4-5 minutes on each side, drizzling more of the marinade over the top as it cooks, until browned and sticky. Mix the couscous and the spicy chickpeas together and spoon onto warmed serving plates. 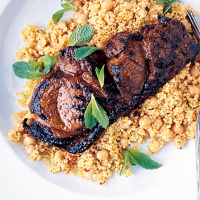 Top with the lamb and serve garnished with mint leaves and dressed salad.